To that end I'm Kickstarting a new site called Pycast. 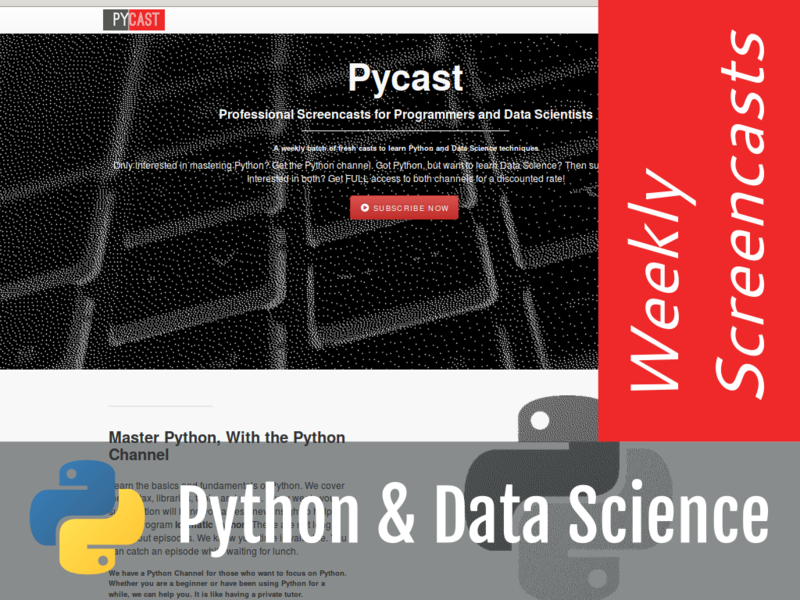 Pycast will provide subscriptions to two channels, a Python channel, and a Data Science channel. users can subscribe to one or both. My aim is to publish content in both channels on a weekly basis. I want it to be at a reasonable price. One month will cost about as much as a lunch (US). The content will cover one topic. It will generally be under 10 minutes, be very code heavy, and show hints as well as hangups. Beginning Python - using IDLE, variables, strings, functions, classes, etc. Intermediate Python - comprehensions, closures, decorators, generators, magic methods. Testing - Unittest, doctest, coverage, CI, linting, generative testing, and more. Environment - Using virtualenv and pip. Reproducing installs, and automation for testing and clean installs. Packaging and Layout - How to layout a package, get it up on PyPi, etc. Standard library - Looking at common modules, and diving into the source. 3rd Party - Review popular libraries, usage, coding styles, etc. 2 vs 3 - Continue stoking the fire here. Writing code that supports both. Collecting data - Scraping, crawling, and automation. Inspecting data - Basic summary statistics and visualizations. Munging data - The fun janitorial work that takes up too much of my time. Analysis and Machine Learning - Classification, regression, clustering, etc. Visualization - Both presenting the data, and analyzing the analysis. Though there is some overlap in the content (hopefully Data Scientists are idiomatic Python programmers), I think the channels will appeal to different groups. I've certainly seen that in my corporate training gigs. Though I might have some videos that belong to both channels (SQL is an example). First of all, I want to try running a Kickstarter just to have experience with the platform. It is a nice way to launch a product. I also want to attract a group of users who are interested in getting early access and providing feedback. With the aim of having a better product when I launch to the world. If this is of interest to you, I encourage you to join for a month, or a year. (If you or your company need training, I've also put in some packages that basically give you a half day or day of training with a year-long subscription thrown in). As of this blog post, I'm at 10% funding. Please spread the word.